In 1778, Reverend Joseph Strong became the colleague pastor to the Arnold family’s pastor, Reverend Benjamin Lord, who was 84 years old at this time. Rev. Lord baptized Benedict Arnold as an infant. Strong is described as having “great kindness and courtesy.” In 1778, the Marquis de Lafayette asked Rev. Strong to pray with Lafayette’s troops when they encamped on the Norwichtown Green for one night due to sickness within the ranks. Strong married Mary Huntington, daughter of General Jabez Huntington, and served as minister of Norwich until 1834. 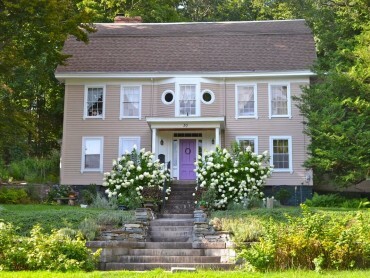 The house is in the Colonial/Georgian style, originally a center hall twin chimney plan, altered in the 19th century.